Leftover spaghetti should not be thrown away. Instead convert it into another delicious dish. 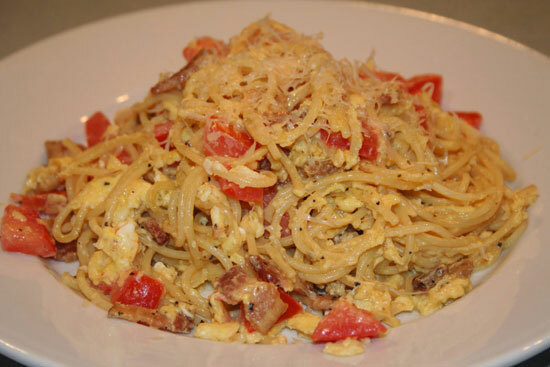 There are at least 2 simple recipes you can make out of leftover spaghetti such as the stir fry and omelet. Get a bowl of leftover spaghetti (1/2 pound) and let it sit in room temperature. Prepare the stir fry veggies and wash them with water and place on a platter. Get a skillet and put it on top of the stove. Turn on the knob and set it in medium heat. Pour in a little bit of cooking oil into the skillet. When the oil is hot, add the ginger, teriyaki sauce and the stir fry veggies. When the ginger and the veggies are almost done, add the leftover spaghetti noodles into the skillet. Wait for couple of minutes around 5-10 for the entire dish to be cooked. When it is cook get a platter and place the stir fry leftover spaghetti. Garnish it with parsley and other herbs. Serve. This dish will get approximately 4 servings. Beat the 4 eggs and combine it with the pasta using the mixing bowl. Pour in a little bit of olive oil into the skillet. Be sure the entire pan is covered with oil. When hot, place approximately half of the egg and pasta mixture into the skillet. Sprinkle the mixture with grated parmesan cheese. Then, top it off with a layer of either grated or sliced mozzarella cheese. After which, add the remaining egg and past mixture. Cook the omelet. Wait until the bottom layer’s color turned into golden brown. For the fun part, be sure you got an oven mitten ready. This can be surely hot. Cover the pan with a platter and flip the omelet unto the platter. Then, put it back to the skillet. Wait until the other side will get cook. Heat the omelet until the other side will turn into golden brown. This dish will get approximately 4 servings.